Guest post by St. Louis-based attorney and old friend of mine Tim O'Connell, who worked at daily newspapers, and a few taverns, before being admitted to the bar. Blogtender's Note: Those readers who've been to The Royale (psst, it's Royale Week here at the blog) know that if there's one thing people like about The Royale (and there isn't; there are always several things people like about it) it's the Subcontinental, sometimes ordered as "that cucumber cocktail you guys make?" But it's got lots more depth -- in flavor complexities and, as you'll read here in a guest post by its inventor, in mixological history -- than that. It began with tzatziki. I’d peeled, seeded, and grated the cucumbers and had dutifully squeezed the shreds with cheesecloth in preparation for adding them to some drained yogurt. It was a hot day. The cucumbers were cold, as was the green essence that collected in the bowl under the cheesecloth. The juice’s clean scent filled the room, and it was incredibly refreshing. It tasted of greenness and health. I decided that cucumber juice might just be the perfect base for a new tonic, but I was concerned about the delicacy of its flavor. I knew from the start it had to be gin. 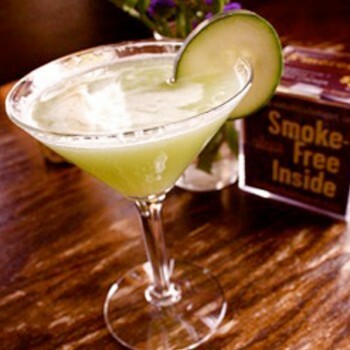 Simple, blunt vodka would dull and dilute the cucumber. Gin’s botanical infusions would mingle nicely and might just carry the cucumber notes aloft. After receiving a juice extractor as a gift, I began experimenting. It took just two tries. The first was gin, cucumber juice, Cointreau, lime. The second try added what brings the drink together: a touch of sugar. The sugar intensifies the natural flavor of the cucumber (think about your grandmother sprinkling sugar on strawberries and allowing them to rest in the refrigerator before serving). If we were to be strictly technical in our taxonomy, we must admit the Subcontinental is a mixed drink, not a cocktail. And its understated flavors and lightness are more in line with a tonic. But its verdant translucency and its perfect cucumber-slice garnish made it too pretty not to put in a cocktail glass. Still, the drink is equally handsome on the rocks. I’ve come to prefer making the drink in the warmer months, and so on the rocks it is most of the time. Steve Smith’s Royale has been serving the Subcontinental since he opened the place. They never, ever, run out of the required fixings. 1/2 teaspoon sugar syrup (2 parts sugar to one part water, NOT “simple” syrup). Shake all ingredients vigorously with ice, then strain into either a cocktail glass or over rocks. Garnish the lip of the glass with a slice of unpeeled cucumber. You may well have to adjust the amount of sugar and lime. 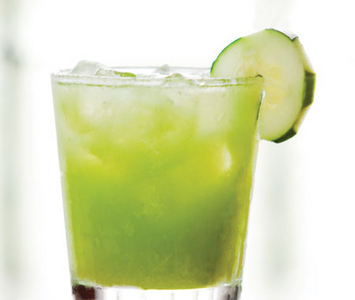 Balance is everything in this drink, and there are two main variables: the intensity of the given cucumber and the acidity and pungency of the given lime. You want to taste the cucumber, as well as the botanicals in the gin. The lime should be barely perceptible (it’s very easy to turn this into a slightly cucumber-y gimlet, and that is not the idea). If the cucumber is not particularly prominent, add a bit of sugar to bring it out. I see no harm in sampling a spoonful from the shaker before pouring to ensure the mix is right. I prefer Bombay Sapphire for its nuance. The more juniper-heavy brands can take over the drink. Some have commended Hendricks to my attention, and while it has a nice cucumber flavor of its own, I worry about it making the drink a bit too one-sided. For cucumber juice, really, a juice extractor is required. It is best to peel the cucumbers first, as they are almost always coated in a food-grade wax as a preservative.